I was walking through my local Marshalls store recently, minding my own business just casually looking for a new coffee mug, and what smacks me upside the head? A PLAID LUNCHBOX!!!! A brand spanking new Aladdin Heritage lunchbox to be exact. A replica of my very own authentically vintage Aladdin lunchbox I found at a antique mall a few years ago. The kind that some of us wanted to take the school when we were kids, but our parents made us take brown sack lunches instead. The new one even has the same schoolyard graphics on the inside of the lid!!! The big difference is my older one has a few scratches and a tiny bit of rust on it, whereas the new one is in never before been taken to elementary school and tossed into a locker condition. Oh, and the replica has a lunch kit inside it so you can actually pack your lunch with it. You know, without your Snack Pack smashing your peanut butter and jelly sandwich. Off topic, but did you have the Snack Packs that came in the round metal containers with the lids you pulled off. And of course you would want to lick the lid to get the last of your chocolate pudding off it, which was sort of like licking a razor blade? I’m surprised more kids didn’t lose their tongues back in the 60’s. There is no thermos, but honestly when I found my old lunchbox there was no thermos either. So we’re twinsies in that aspect! I’ve used my old one when I made a cocoa station for the holidays one year. And I always drag it out when Back To School season comes around. It seems to pop up in different vignettes whenever I need to get my plaid fix on. Which, come on, is ALL THE TIME! So I decided to grab that lunchbox off the shelf at Marshalls and give it away to one of you! And since the lunchbox was a whopping $7.99 at Marshalls I felt a little cheesy giving away JUST that, so I added a $50.00 Amazon gift card to it. That way you can buy a matching thermos or a new car or whatever the heck you want! There are none. OK, maybe just a few. One winner will be drawn randomly from those who commented. Giveaway entries end Wednesday, February 28, 2018 at 11:59pm. I’m not doing one of those official RaffleCopter Giveaway thingies, because when I do those for Country Living tickets or something like that hardly anyone enters and then I look like a dweeb and I really want people to enter this thing! PS – they also sell these on Amazon (I have them on my Amazon Store page). Or you can try to find one at your local Marshalls, T.J. Maxx or Homegoods (they’re all owned by the same peeps). I remember these lunch boxes so well but never had one either. Perfect for packing our snacks when traveling or on a day long shopping trip. Also love your hot cocoa station! Love the plaid lunch box I had no idea you could buy a new one. Thanks for information. I love, love. love this lunchbox!! It would be so cute with my vintage Thermos collection (several of which are plaid!!). 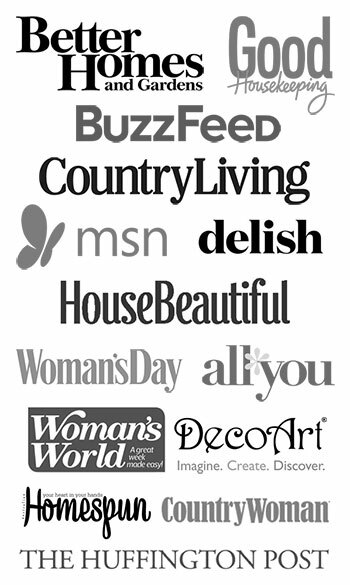 Love your blog, so many cute ideas for decorating and such. I had a Barbie lunch box as a kid, but as an adult I would love a plaid one. My son lots of lunchboxes ad I saved a few. But I’ve never seen a plaid one. Love it. Thanks for a great giveaway. Like you I always wanted a plaid lunch box, but I had to “brown bag” it too. It’s funny the things we remember as adults. I love your vignettes! Such creativeness! I love the lunchbox. I would use it on my porch and plant succulents inside. My mom made my lunches, as well as my brothers and sister, in brown paper bags. This is such an adorable lunch box, I’d use it every work day~ because 99% of the time, I’m a lunch packer! Throwing it back, old school style! YES!!! I have a plain red vintage lunchbox that I use for so many themes! I would love a plaid version! Thank you. I love the lunch box, but I love how you decorate with your even better.. So talented. I don’t usually leave comments, but I do read you blog. And I enjoy it so much! I hope you have a wonderful week. I am loving the plaid! I also have several vintage Thermos’s and use them all year long in different vignettes. The lunchbox would be a great addition. Love your blog! What a nice give away! Love the lunchbox. I did have one as a kid, but alas it was unceremoniously tossed. I have mixed feelings about such reproductions, but I could use it to make adorable vignettes like yours, I could overlook the lack of authentic vintage-ness. ? Your vignettes never fail to stir great memories & nostalgia, Pam! but we got robbed with NO thermos….I would have rather had that inside…. A staple vintage item that’s so versatile. Love the adorable cocoa station you made with yours! So cute! Love this site. I thought the little vase hedgehog was cute to stand a card up in etc. I love retro and repurposing things I have received from the family homes. Thanks for the ideas. I saw this at my local TJ Maxx too, and was so tempted! Lol! ❤ your posts! The first thing that came to mind was what a cute picture the lunch box would make with my two grandsons sharing a late picnic lunch out of it in the park. I hope I win so my daughter can make this picture a reality. I was just like you I carried those little brown paper bags to school sometimes like my daddy carried his to work. He had a lunch pail but many times he just carried the little brown bag with a bologna sandwich in it. I still use those little brown bags for my gift giving treats or something I think is special that I want to share with someone. I add my gift, twine tie it up and add a cute lil homemade gift tag. I pinned the cocoa station I love that idea. Oh how I LOVE this lunchbox! I have been looking for a vintage one forever and have never found one! I would love to win this so I could make a hot cocoa bar as well! I read your blog and your decor is closest to my heart! Thank you for the opportunity to win the give away! As a kid I remember eating in the cafeteria and we just called it the “caf”. I did have a blue lunchbox, now long gone. As a girl I would have preferred the plaid! I love your blog and I admit that I imitate (copying is a form of flattery, lol) many of your cute and clever ideas. I would use the lunchbox in a spring vignette with yellow tulips. Here in MN we are ready for Spring. I also had no lunch box, just the brown bag. Keep your posts coming, enjoy them. Love how creative you are! Oh how I have wanted one since I was in 5th grade. My pretty blonde friend had one (I had a brown bag) and my mother told me my friend hung out with me because I wasn’t as pretty as her so she would get all the attention. Ouch! This is so so fun! I definitely carried a metal lunchbox to school in elementary! Great memories, I used to have one as a child for school. I’d love to have another one to take my lunch to work. Thanks for the review. Love, love this lunchbox… oh my, how it takes me back… to so many great school memories. Oh my gosh, I’m in love with both of those lunch boxes, vintage is of course the ideal but anything close enough to it even if its new, heck, i’ll take it!!! Thanks for hosting! I’ve always wanted a plaid lunchbox since I was a child. Whenever I see your beautiful vignettes I flash back to wonderful childhood memories. Thank you so much for sharing them. STAHP. That lunchbox is the CUTEST! I love plaid! His is super cute! ? Btw, I totally licked the snack pack lids too. Such a nostalgic lunch box, and takes me back to my childhood when I had a Walt Disney lunch box in the 1970’s in grade school. I love your blog! You always make me smile! Thanks! The lunchbox is so cute and I love how you decorate with it! Fun giveaway…I would love to win! Thank you for hosting! What a fun give-away! Thanks for being so generous! 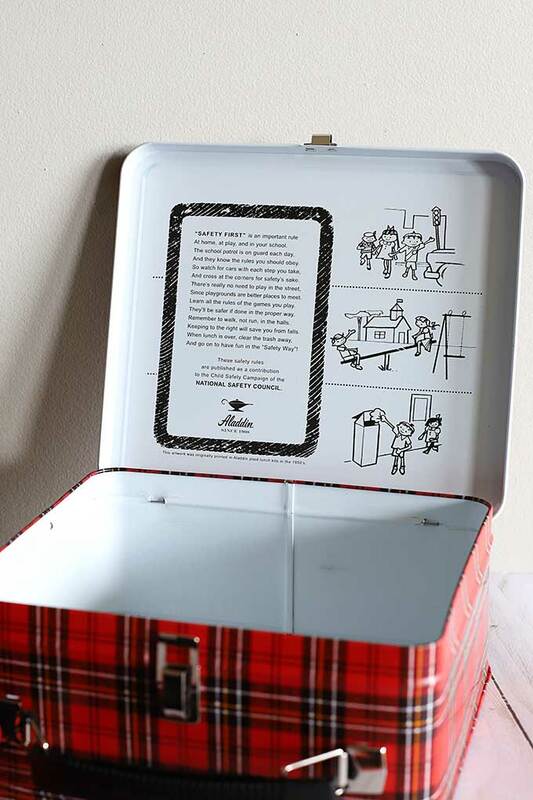 The plaid lunch box brings back happy memories. I had many different lunchboxes as a child. I cannot remember specifically which ones, but I recently acquired a SF Giants one after attending a game. Lunchboxes would make great storage for fabric odds and ends. That plaid one is very cute. I LOVE this lunchbox!! I think it makes the food taste better. Love anything plaid! I always wanted this one just like everyone else. I get out all my plaid when I decorate my porch for Christmas. I think I would have to copy your great hot chocolate station idea with this lunch box. Thanks for the inspiration and the giveaway. Aww..this WAS my lunch box way back when! I had only brothers and my plaid lunchbox was the best! They preferred paper bags, but not me! LOVED it then, LOVE it still! I didn’t get to eat at school. Overcrowding at neighborhood school forced district to bus about a dozen of us to another one. We got bussed home for lunch if we wanted and had an adult there. That wouldn’t happen today!! So I would love one especially for the coffee / hot cocoa bar. I so enjoy your blog, Pam. Your sense of humor is such a hoot! This plaid lunchbox is ADORABLE – love your little cocoa station. Boy does this bring back childhood memories! What a find! Wonderful! Love the cocoa station and back to school display. Would love to have a plaid lunch box since I was one of the brown baggers back in the day. Love the nostalgia and the versatility of this great lunch box. And Amazon… Both are fabulous! A lot more fun than a brown bag. I even remember taking milk in a mason jar in my school lunch. Never heard of the containers in lunch boxes/bags today. I had a plaid lunchbox like that and I do not think it came with a thermos. Now, this year, I will be 65 so I am willing to admit that I’m loosing my marbles, but my mother was the kind of mom who wasted NOTHING and I never recall using the thermos. Any other elders willing to back me up on this or should I just go and lay down and take a nape? “Take a nap, not nape…” Sounds like good advice, or more coffee!!! Your vignettes always touch the LOVE button in my heart. Thanks for sharing your talent and making my brain think of ways to pull things together. I certainly don’t want you to look like a dweeb! I would have entered any way I could, because I’m feelin’ lucky! I love this plaid lunchbox. I’m not sure I had a lunchbox when I was in school. Brown bag comes to mind. Oh, my goodness, the plaid lunchbox brings back warm memories of the time when my children were little. It is exactly like the one my daughter took her lunch to school in! Thank you so much for sharing and reviving those sweet days of youth! 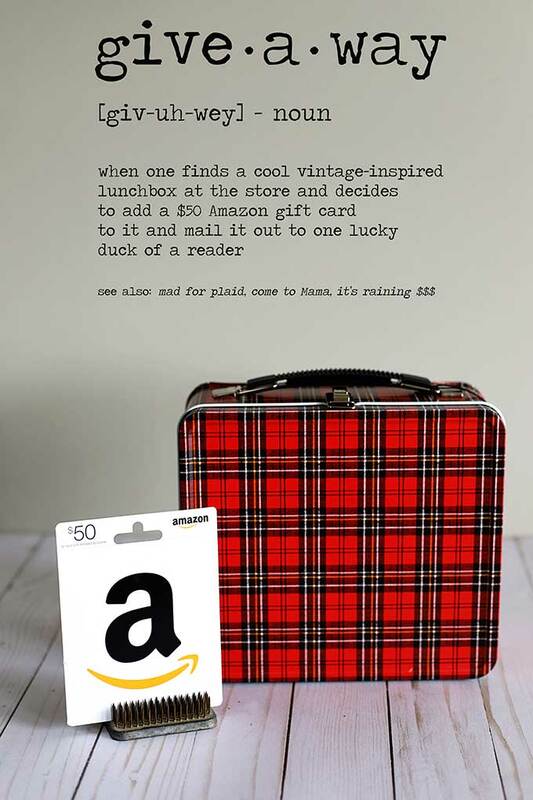 Love this giveaway idea and the trip back in time!! I was also a brown-bagger, on those days we didn’t walk home for lunch instead. Which…would never happen now with closed campuses. Wasn’t unusual for a student to just not go back for afternoon classes!! LOL Not, me, though…I always went back! Thanks for being here…my heart lifts whenever I see your posts arrive! I have a plaid thermos, I pick up at a yard sale because of your blog showing decorating with the plaid lunch box & thermos ! I do not have a lunchbox yet. This lunchbox is cool. To my amazement, I found an original Mickey Mouse Club lunchbox like the one I had in the 1970s. VERY exciting. I have loved plaid since I was in middle school when my mom showed me three kilts made in the family tartans. Never for me bc she had a very tiny waist. I was in TJ Maxx the other day and saw one of these. Each time I see one I think of you and your plaid collection. I’d love to be the lucky winner. I have a plaid folder that I won when I sold Rubbermaid through the home party plan back in the 70s. My folder hold silverware and knives for a picnic. Lunch box would be really cute next to it on one of my shelves. I also have a hard time passing up anything plaid! I also have the vintage one and several thermos in my collection. Would love to add this one! I love Your vignettes and love vintage anything especially reminiscent of my childhood. I no longer have many things left so I am trying to find a few things that will fill the void of that loss. I am happy now to have a few pieces of my Mommas Pyrex and Correll. I really love the plaid lunchbox. I had a separate plaid thermos bought as an adult but it is one of those items that I no longer have. Whenever I see metal lunchboxes I have a hard time resisting them. Thank you for s the walk down memory lane today. This lunch box is so cute and fun, who wouldn’t want it… Love your blog…My favorite by a long shot…. I lived in Norwich Ct when the Thermos factory was up and running for decades. Tons of jobs and they had a store for all the great items they made. I love the history of that little tin box! Thanks for The Offer And Memories! Love the lunch box, what is not to like. Please enter me in. Tin lunch boxes are very iconic of the States. I got one of these at Marshalls about a month ago… for only $7, what a bargain!!! Mine is now stuffed full of sewing supplies I need for a class at the the John C Campbell Folk School. It will be like going back to school in the 50s!!! I love the red plaid lunch boxes and thermos. I found one at TJ Maxx a couple of years ago and have it sitting with other plaid items I’ve gotten over the years. I don’t think you can ever have too many. Thanks for giving us the chance to win one. I started with the brown lunch bags in the 1960’s and IF I was lucky, my mom would draw a bunny or something on the bag which REALLY made my day. We had to reuse the same lunch bag all week, so I am guessing that is why she drew on them! Eventually I did have the red plaid lunch box – not sure if it was a hand me down (probably from my sister) or new, but I did love it! Thanks for the contest! I love the lunch box also. It sure would be a blessing to have memories of my childhood days. My mother has gone to be with the lord, and she always packed my lunch.thanks for the memories. Love Marshalls, love plaid and love your blog! I thought my odds were good, then I see all these comments and I am like WHAT THE HELL PEOPLE. Also, I hate running giveaways because of the exact reason you listed. I don’t want to have to wear a sandwich board on the street to advertise it either. I really want both the lunchbox and the gift card for obvious reasons but the main one is that I will pack MY lunch each day in that box, even though I work from home. It will make lunch less depressing. Too cute! Perfect for winter! I love treasures that have a story or bring back memories! Carrying a metal lunch box with a thermos inside is a great memory! I would have liked a lunch box like that but I think they were a few years after I got out of grade school. (I’m 67 so a lot of things were after I got out of grade school and since I got the requisite brown paper bag each day (I remember my mom saying bags only cost 25 cents why would I pay for a lunch box) I stuck with paper sacks. I remember the nuns would take the paper bags after our lunch and save them. Many times they gave them back to our parents at the end of the month. That would be fantastic to have. With five brothers and sisters, we had to brown bag it. Love this box, especially all the ways to decorate with it! 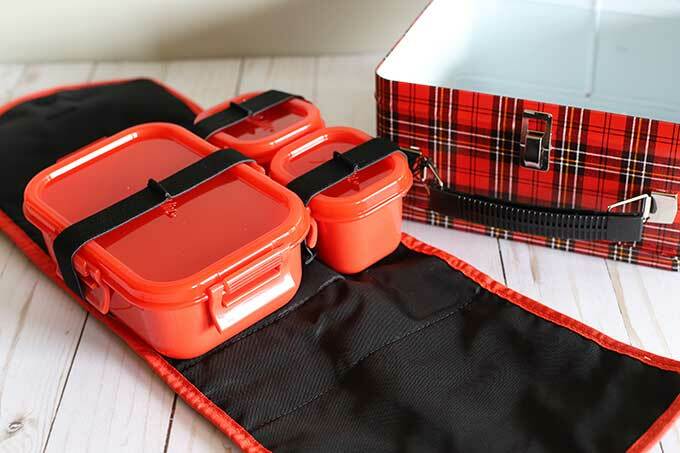 Oh my… my FAVORITE – red plaid lunchbox!!! I have ‘copied’ your vignettes that last few years, because I LOVE LOVE LOVE thermos / plaid, etc and just love your little ideas. Would be heaven to me if I won this little goodie, and the gift card! Thanks for the give-away ! I remember my brother using the original of this lunchbox. So cute. Oh my! Although I have seen this lunch Plaid Lunch box in many pictures, I wish I could lay my hands on either my old plaid lunchbox or a picture of me carrying it to First grade. I had one for all of my elementary school time, but I am afraid it went the way of my Lady Marian ballet costume. Maybe this is why I still love metal boxes to secure my treasures, I am pining for my plaid lunch box. Fashions and Fads come and go. I have loved plaid since I was a little girl! I do like florals, but my favorite pattern is Plaid. This is such a fun post! I never had a lunchbox as a kid, only brown paper bags. I’d love to take my lunch to work in this beauty! Thanks for sharing and the chance for all of us to remember the good ol’ days 🙂 And, as always, Safety First! LOL!. One of the highlights of the school year was picking out a new lunch box. My favorite was my black, vinyl bubble-haired Barbie. I started collecting plaid thermos a while back and this lunchbox would be an amazing addition to that collection. I had plenty of metal lunchboxes growing up. And you are right, it’s a miracle we didn’t all die because things were never refrigerated. But what memories. I remember what a treat it was to get a Little Debbie snack cake every day at lunch. And sandwiches like bologna and cheese. And apples and oranges. And a thermos of Hawaiian Punch. Meeee, oh meeee! I also paper-bagged lunches to school. I always had to take my lunch because I was a very fussy eater and if you bought a cafeteria lunch, the mean teachers made you eat everything on the plate, even the yucky stuff! I’ve never owned a lunch box myself, but my 3 sons each had Snoopy or Batman, or whatever was popular that school year. I would love to own one of my own, and this one is just perfect. What an awesome give-away, and the Amazon card as well. Thank you so much for the chance to win. This lunchbox would be the perfect thing for snacks, on our car trips up North. Ahhh……..so many memories connected to the red, plaid lunch box I used to carry. Brings feelings of the warmth and joys of childhood. My Dad used to have the large, plaid thermos for adults. I love the lunch box! It can be used in so many creative ways, just as you have done. BTW, I really enjoy these newsletters too. I think I had a Scooby Doo lunch box. Probably a hand me down from one of my brothers. Then again, it might have been Star Trek, or Star Wars. So many good memories that lunch box will bring! Thanks for the contest, and your cute blog! What a wonderful plaid lunchbox!! So many ideas come to mind. And thank you, Pam for such a generous give away for some lucky person! my gr=kid who is 7 ,loves lunch boxes. she has several and she says it’s because you can’t use the same one every day!i understand this and would love to be able to give her this one.i also use them regularly to house various things when i’m going somewhere in the car. This was my lunchbox in grade school. It had a matching thermos. I don’t know what happened to the box, but it probably still smells like tuna and sour milk. Pick me! I have a red/black plaid thermos that would love to pair up with this lunchbox. What a sweet giveaway….I recently moved and sold a lot of my decorative items, but it was a cross country move and we had to. I also just recently became a lover of throwing plaid into things here and there! How awesome would this be!!! My kid would legit use that. So cute! Love the lunchbox. Really like the lunch kit inside. Now I want to make your cocoa station for winter times. In Elementary school I ALWAYS wanted a lunchbox with a thermos, but Mom insisted on a brown paper bag and $ to buy milk. Love the plaid design. So inspired by your posts using your plaid lunch box that vrought back childhood memiries that I had to have one. I got mine off Amazon and paid more that that lucky $7.99 you found but love it just the same. It’s now a Christmas staple! I love plaid & remember that lunchbox, though not from anyone in my family. My brother had Tarzan & I had a 60s lady in yellow (no clue why I chose her). I really love how you stage yours for various seasons & holidays! I recently found a lunch box I had as a child in an antique shop! I was even more thrilled at the price, and that it had the thermos still with it! The name of the original owner was attached on the handle too!! I love these precious treasures, as they work great for storage of some of my smalls! We had the nutritional school lunches in the institutional green divided trays. Gotta love the canned spinach & tuna tempters on Friday (yes, in the 50s they catered to the Catholic kids who couldn’t eat meat on Friday.) Would much rather have a plaid lunchbox. Celebrating “dweebs” everywhere! This mad for plaid gal is ready to join the dweeb revolt? I regret giving up my plaid box to my sister and then the one even younger still for a cartoon box that didn’t have the same costiution. They have done a great job with this! Great eye! I’m mad for plaid and have been collecting plaid for many years now. I use my plaid pieces in vignettes in the summer, at Christmas and they have even shown up in a Valentines Day center piece. I have looking for a lunch box! All the one I have found were in such bad shape I didn’t think it would add to my collection. I love the one you found at Marshall’s. I hope my name is selected! Mad for Plaid? I will regift to Martha a third grade teacher..She always packs Her Lunch For School And Spends Her Own Money On Supplies For The Kids. What a neat give-away! I’ve been looking for a plaid lunchbox to display with my antique student desk. I have a permanent scotch plaid coolers and thermos vignette. The more plaid the merrier I always say! I wanted a new one. I got my brother’s sans the thermos because it broke when he threw it at me. They are so cool. I enjoy your blog. Thanks and keep it up. Had a metal “Flipper the Dolphin” lunchbox when I was a child-back when the thermos had a glass liner. (yes I am that old.) It would be a hoot to have a plaid lunchbox to take my lunch to work in now. Love it! Pick me please!! I love the old school look with the new containers. So clever. I’d love to win this! Ohhh I Love It! ? I would love the plaid lunchbox to display my vintage christmas items. Never had one. Had to “brown bag it” in those days. Guess if I don’t win I’ll have to go buy one. I had a lunch box just like this when I was in elementary school!!! Would love, love to have one to use and display!!!!!! Metal lunch boxes were the norm during my childhood with the thermos, until broken thermos replacement became a real problem. The broken glass along with the cold milk really made a mess. Eventually my motber chose to forego the thermos and I had to buy milk at school in those little cartons. I am in mid 70’s so plaid was the norm also. I remember carrying a Holly Hobby lunch box, I still love those old metal lunch boxes. And this plaid one is the cutest! Your hot cocoa station idea has me thinking the possibilities are endless for this cutie! Thank you for the inspiration and giveaway. Yay. For Joy! Matches my thermos that you encouraged us to go out and buy. I did. Love the plaid lunch box! Would love to add it to my collection of random lunch boxes.It would look great between my Oreo cookie one and Paul Frank monkey. Always enjoy the humor in your posts. You light up my day! Thanks for this great give away. Hello. You inspire me! Thank you for the opportunity to play and get ready for yard sale season!! I remember the yummy smell that rose up every time I opened that plaid lid. Peanut butter and jelly wrapped in waxed paper. Along with celery and chips of course. Thanks for stirring up the memories. I always wanted a lunch box as a kid, but we had neighborhood schools so everyone went home for lunch! By high school, you wouldn’t be caught dead bringing your lunch from home, ate cafeteria food instead, so I missed out again! I remember loving this lunchbox when I was a kid. My friend Lori had it and I thought she was so cool. This is a great giveaway. Thanks for the opportunity! This little lunch box brings back so many sweet memories. In elementary school my teachers always made comments about the lunches my mother packed for me in my little plaid lunch box. It was always little tea sandwiches with varying fillings from day to day, a piece of fruit and a small dessert. The sandwiches were wrapped in wax paper. 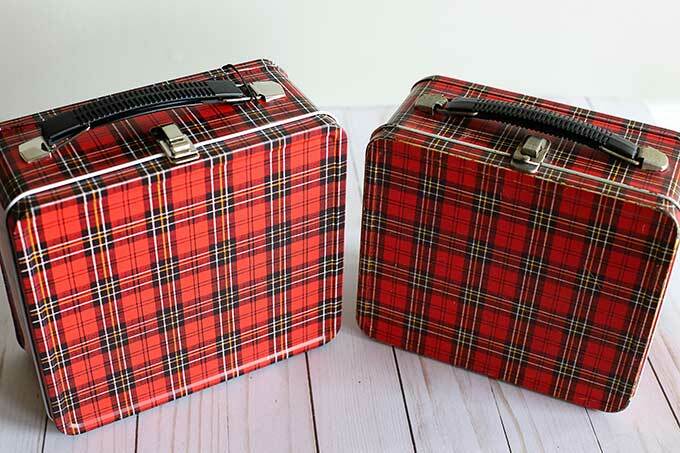 If I had a little plaid lunch box now (I’m 64) I would pack it up the same and head to the park for a sweet pick-nic. Makes me smile! Good evening! It’s such an adorable lunch box! I saw one at my Home Goods store a bit ago and was dying to buy it but I just couldn’t. I love how you used it as a Cocoa station. Super cute! Oh my goodness- what a cute lunchbox! I’m a quilter and it would be so cute to use to carry my sewing tools. I love red plaid tins. They remind me of my elementary school days. Thank you for a chance to win. Pick me! Pick me! Love me some plaid – and I too never had one growing up. Always the brown bag and trying to remember to bring home the tupperware sandwich box without the lunchbox to keep it in. The struggle was real people! The struggle was real! So cute! I can think of a ton of ways to use this lunchbox including taking my lunch when I’m on the go. I am still stuck in the 50’s and carry my little noddy metal lunch box with me when we travel, yours is lovely and my husband could put his lunch in that one, and we do have a little thermos as well. I am hoping to win this unique prize. Thank you for your inspiration and thoughtfulness thru this giveaway! I did have a plaid lunchbox when I was growing up. Would love to have one now. Seeing the pictures of your vintage one and the new one brought back lots of wonderful childhood memories. I remember those days of sack lunches. This one is so nice and on trend. I love it! I do so love plaid! The cocoa station also looks really functional and cute! Good luck, everyone! I never had red plaid either. My lunchbox had blue & pink flowers on it. Would you believe I still have the thermos from my first grade lunch box? Yep I do. LOVE THE LUNCHBOX!! !And love your blog thanks for brightening my day! I just love the lunch bo. Love your idea of coaxial station. I think for porch time it would look very cute with a plant or two in it. Whoever wins it is lucky gal. We’re lucky reading your blot. Happy picking! It is really adorable. It would be fun to use it as a gift basket and fill it with good snack treats! Dang, there are a ton of plaid lunchbox lovers! I am as well! I didn’t have one either growing up but all my cool friends did. So it would be really cool if I could have one now because I’m pretty sure my friends don’t have theirs anymore, so I would be the cool one now! Seriously, it would be pretty cool to add this to my collection of one. Yeah, I know it’s not quite a collection yet but winning this one would help. ? I totally love plaid and have found memories of using a lunch box to take my lunch to school. I think mine were all plastic, but I swear I can still remember the scent of the box. And I remember eating peanut butter and jelly sandwiches. So, fun! Anyway, thanks for the interesting post and for the opportunity to win a cool lunch box and a gift card! Sweet! We don’t have a Marshals anywhere near us in Montana so even though it is just a $7.99 value, it seems priceless to me!!! We had to eat school lunch so never got to have a lunch box! I wanted one sooo bad since they seemed sooo cool! Maybe this will be my chance at age 62 to finally have one!!! Love your blog and the stuff I’ve gotten from your etsy shop!!!! I always enjoy your creative ideas and fun decor! 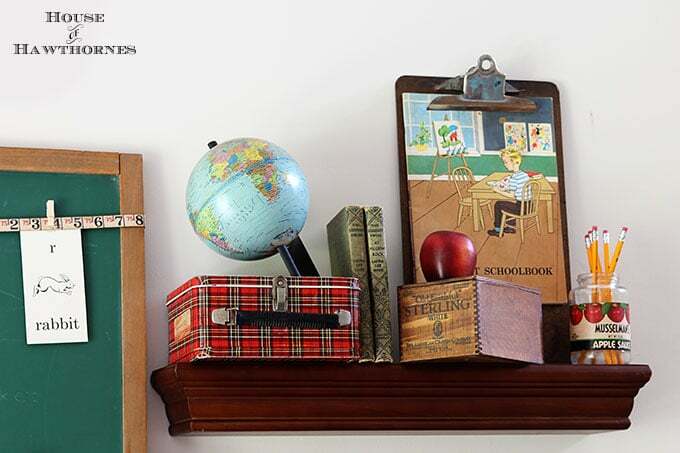 Is that a copy of The Bobbsey Twins on your Back to School shelf? I have the same one! I would love to have an adorable plaid lunch box to go with it!! It is! I found a few of those books at an estate sale. They’re sort of musty because they were in a brown box in the basement, but I bought the best ones! Did someone say…..Snack pack!!! Oh the memories you just brought back. A plaid lunchbox would look so cute in my retro kitchen. So sweet of you to offer this giveaway. I love the use of this as a cocoa station…perfect! Would love to win this. I love this! I would share it with my sweet granddaughter so she could be the coolest 1st grader at her school! This makes me almost as excited as when the new school supplies come out each year! Love the graphics inside the lid so very much! I love the plaid lunchbox! It’s gorgeous and I loved how you used yours in your cocoa bar. Oh I love anything tin! And I never had a lunchbox. I would love to take my lunch to work with me at the vintage store that I helped open with a friend! Thank you Pam for the awesome give away! I’m a sucker for anything plaid, and most anything red!!! I had a plaid lunchbox as a kid! I don’t have my original one but I do have a vintage one! ? I have two plaid items and would love to add the lunch box to my little collection. I love your vignettes. Plaid is my new favorite, especially red! I just bought the same lunchbox at Homegoods the other day & I love it so much I going back to buy another one. Oh my gosh ! We all love the lunch box ! I love the lunchbox! Nom! I love red plaid! Nom! I love your blog! Nom!Nom!Nom! With all this nomming, I NEED THAT LUNCHBOX! I also carried my lunch to school in a paper sack. I spent two years in school studying food and ended up a Lunch Lady while my kids where in the building’, that very same building I carried those sack lunches to. Red is my favorite color and we all know lunch tastes better in a lunch box! Thank You for this post! plaid skirt, with boots and a plaid bow in my hair. I had a plaid thermos and an old vintage typewriter for a prop. Even set my eyeglasses down on my nose and looked over them in a sassy way. I love that plaid schoolgirl look. My oldest daughter lives plaid so it would got to her! But the gift would be all mine! ? I have a plaid thermos. Would love a plaid lunchbox. Do love your posts! Love the lunchbox! I was a paper bag lunch kid too. I love the lunchbox! Your decor ideas especially the hot cocoa bar really get my mind spinning. Thanks for the awesome ideas. Howdy from Texas, Pam! I love your blog and feel like we could sit on my front porch, ‘shoot the breeze’ and talk about lots of vintage memories while sippin’ our sweet tea or coffee! God Bless! That’s so cute! I lived one block away from my elementary school, so I always went home for lunch and never had a lunch box. By the time I had kids, the lunch boxes were plastic. That plaid would make a cute decorating addition. Thanks for the opportunity! I was just telling my son the other day about pudding in a can. Those lids would be considered a weapon these days. Actually, it would be a weapon, now that I think about it! Thanks for the chance at the super cute lunch box and the Amazon card! PS My friend bought one of those lunch boxes at TJ Maxx around Christmas. I didn’t have a lunchbox either, just paper bags and wax paper wrapped sandwiches. And now people pay big money for lunch kits with their name embroidered on it! I used to trade sandwiches with another girl. Oh, the good old days! Mad for Plaid!! What a cute lunchbox and love how you use it in your displays! Thanks for the opportunity to win this charming lunch box! I had a lunch box just like that!!! LOVE LOVE LOVE!!! Even if I don’t win, I’m totally getting one! I also have the vintage version but would love to rock a new vintage one at school! The lunchbox is really nice and what a low price! I really like your idea of using it as your cocoa station too. The highlight of back to school shopping for my sons was picking out their METAL lunchboxes. Oh what decisions! So wished I had purchased some for myself! I used on have a plaid lunchbox just like this 50+ years ago! Memories. Oh, you’re bringing back memories! I love yours used as a cocoa station – great idea! Ohhhhh how those lunch boxes bring back such good memories! OOOOOH! I love that lunchbox!!! How cute is that!?! I love your creativity..wish I had just a pinch to get started on clever. I had to laugh thinking about the pudding lids, and you are right, how many tongues where cut back in the 60’s and 70’s! Happy to report there was no damage to this tongue, lol!! Great giveaway, these plaid lunchboxes are so awesome, thank you for the opportunity. I love that lunchbox! I definitely need one for my imaginary cabin! What a Wonderful Giveaway!! Thank-You so much for the chance!! My Honey would use it to take his lunch into work!!! No more brown bags for him to use!! Mad for plaid! I have my old metal red, white, blue lunchbox with graphic designs & names of all the states from the 60’s I took to school until it was uncool, & we all carried brown paper bags instead. I’m talking penny loafers & bobby socks. I loved my “oxblood” loafers. Sweater guards on my cardigans & my flip with matching headbands. I’m OLD. I actually had this very lunchbox! I think it had a matching Thermos. This was around 1967-69. Before that I had Campus Queen! After about 1970, only younger kids had lunchboxes, and we cool junior high people used the brown paper bags! So I guess you were COOL! I was so jealous of the plaid lunchbox carrying kids when I was in grade school! 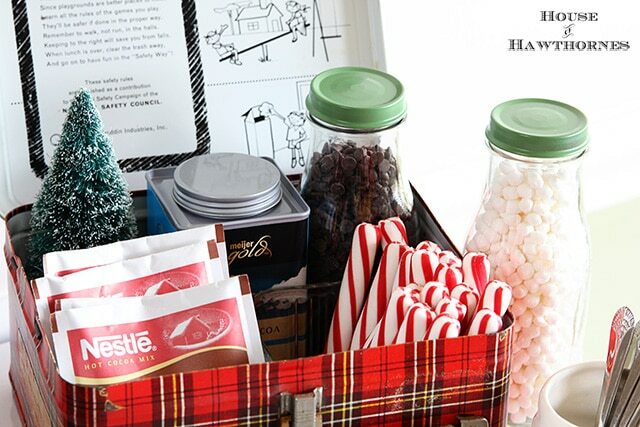 Love your idea of the hot cocoa station using the lunchbox! Super cute! What a cute lunchbox! I love how you decorated it for Christmas. How fun! I love how things from our childhood are coming back in style! Makes me smile & feel young again lol! What a great idea for a cocoa station! I’d love to copy that idea! You’re so creative! Have a great day! It would be fun to add this to my home decor. I really want to take this opportunity to thank you for the great craft ideas and tutorials you do. I love and look forward to incoming emails from your HOUSE of HAWTHORNES ! Thank you! How kind of you to include us in the joy! I love the lunchbox, and I always enjoy shopping on Amazon! Thank you for the giveaway. Love the plaid lunchbox. Love your ideas for the lunch box in the back to school vignette and hot chocolate station. I appreciate it when your posts make me look at regular objects in new, creative ways. Thank you. I loved the plaid luchbox! It is so cute! This is a fun giveaway! Have you seen any other vintage inspired items at your local Marshalls, other venues? World Market normally has some cute vintage-inspired items and there’s tons on Amazon. 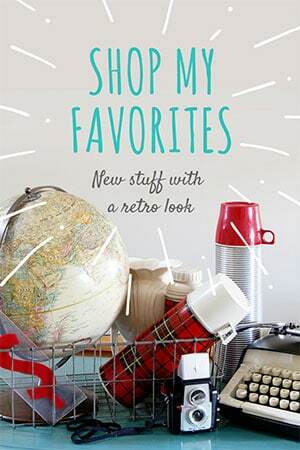 I have a Amazon page where I try to add anything vintage inspired that I run across when I’m shopping (https://www.amazon.com/shop/houseofhawthornes). This is s a lovely lunch tin. I need to get a lunch box for my son who will be starting school soon. Hello! This lunchbox isn’t absolutely adorable and I love the way you have repurposed it and have used it as decor! I would love to try to use it as a hot coacoa bar! Thank you for sharing this find with us!